Managing producer and director of “Defamation” Kimm Beavers addresses the audience in a post-performance discussion. Personal biases and rhetoric often impede upon decisions that politicians, community leaders, citizens and even students make. Words have the power to change viewpoints and society at large. 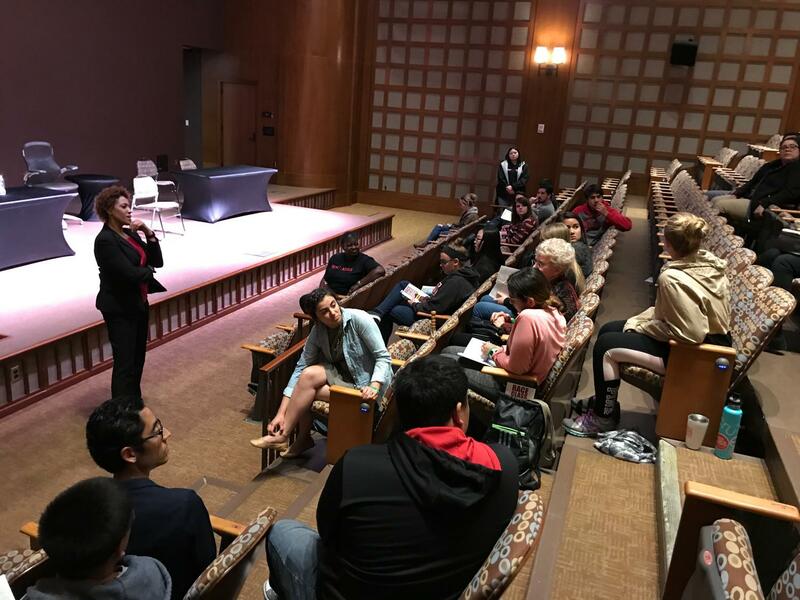 “Defamation,” a traveling nationwide play about the use of civil discourse, made its way to San Diego State for the third consecutive year on Feb. 12 in the Conrad Prebys Aztec Student Union Theatre. This is the eighth year the play has gone on. There have been over 400 shows seen by over 75,000 people. The play was hosted by One SDSU Community, an organization that provides intersectional opportunities and unites diverse groups through dialogue and diverse conversations. The play was a mock trial between Regina Wade, a black woman, and Mr. Goldstein, a white man of Jewish decent. Wade, a graphic designer, was suing Goldstein for libel after losing one of her business’ major clients, resulting in direct financial damage to her business due to a false statement. Lawyer Ms. Allen represented Mr. Goldstein while Mr. Lawton represented Wade. After Wade made a professional visit to a potential client at his house, Goldstein’s watch, a family heirloom, went missing. Shortly after, one of Wade’s law clients decided to hire another graphic designer, inevitably causing her business to collapse. Media studies senior Cristian Alvarez is an active member of SDSU’s Civil Core, which co-hosted the event. He originally joined the organization to be part of an organization that promoted what he valued and stood for — he found that in Civil Core. At the end of the play, the audience acts as the jury and decides if they are in favor of the plaintiff or the defense. In this case, Wade won the lawsuit, however the audience had a mixed response about the case. Beavers said that the verdicts change each year and at each school. Alvarez said that the discussion afterward was very eye-opening because the audience got to hear varied opinions about what they thought of the case that didn’t cross his mind when he was analyzing it. He sided with Mr. Goldstein based on the facts of the case, but he said he wanted to side with Wade because she represented minorities who become victims of a skewed criminal justice system. “I don’t want people of minorities or color or of certain genders to go through things that are just not ideal for any human to go through,” Alvarez said. “It’s just something so unfortunate that affects so many people all over the world. Many students were called on during the discussion to give their opinions about why they voted the way they did. Some admitted to having personal biases. Beaver’s discussion focused on interpretation of preference and prejudice and recognizing personal biases. Beavers said organizations like One SDSU help promote inclusiveness and multiculturalism, something that a lot of schools struggle to figure out how to do. “The one thing that I do like about SDSU is that (the community is) really being very thoughtful about how to move forward to create a more unified campus and operation,” Beavers said. Coming from Hispanic decent, Alvarez said he relates to the issue of race in the play. He said that growing up, and even currently, there are times he faces certain stereotypes.